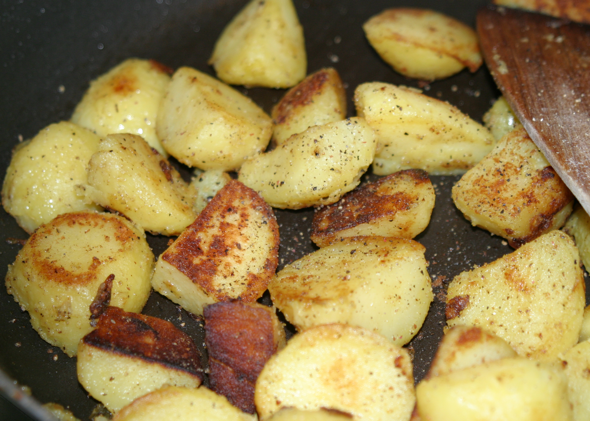 Sauteed Potatoes are the simplest but most satisfying of all recipes. Easier than french fries, and probably a lot less greasy too. And kids will love them too! – 5 to 7 medium sized Yukon Gold potatoes (but any kind of potato that holds well together after boiling will work, I just like the taste and texture of Yukon Gold). That’s about 1.5 to 2 lbs. – boil for 20-30 minutes (this part really depends on the potatoes and their size, so using potatoes roughly the same size helps) till a pointy knife can go through a potato without much resistance, but before the skin starts to crack and peel off. – place a generous amount of olive oil in a large frying pan and heat on medium high. You want the potatoes to absorb some of that oil, but not too much! – the whole process should take about 10-15 minutes. This recipe goes great with a grilled meat, sausages, or dried meats like prosciutto.